With Mercury retrograde in Leo since July 14, we’ve had a dramatic experience of fuzzy thinking, miscommunication, technology breakdowns, lost items, and obstacles to creative expression. The retrograde lasts until August 8 (CDT), although it may require a few days after that to sort out your experiences during the retrograde before you can move forward. Whenever Mercury is retrograde (generally three times a year for about three weeks each time), we have an opportunity to re-think areas represented by the sign it occupies. With Mercury in Leo during the Sun’s journey through its own sign, we have a stronger than usual opportunity to consider Leo’s themes of spirituality, the heart’s desire, creative self-expression, and childlike joy. Take this opportunity to slow down, go within, and review anything in your life that has brought challenges, delays, or frustrations. 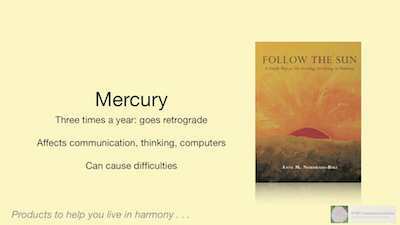 We offer several resources about Mercury retrograde, including some of Anne’s blog posts on how to make the most of these slowed down periods. Visit our Mercury retrograde section now to see all these resources. Wishing you much fruitful introspection and many wonderful insights during the final days of this Mercury retrograde!